Parents are angry and frustrated by the economy slowdown. 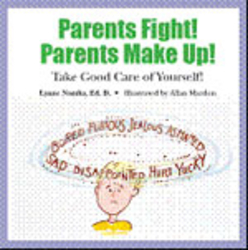 Here is a book to help children deal with parents’ conflict. Today’s children are more in touch with angry feelings, but don’t know how to release them safely. They feel helpless when overhearing family arguments and internalize anger. Children need skills to deal with parents’ frustration and arguments which are more frequent during this poor economy. Developing life skills such as talking about feelings and using self-regulatory skills of anger management is necessary for good self-esteem.